Here is an invitation from Adriann Kragten to test his design ideas and develop a pumping wind turbine project. Please note that Adriaan has never built an axial flux generator, so these instructions are not like my Recipes which are based on decades of experience, but the document is very rigorous and mathematical, and covers every theoretical detail. Adriaan has a designed many successful wind turbines based on induction motors as can be seen on his site. This is a great opportunity to work with an expert. “Up to now, 17 public KD reports about different aspects of small windmills can be copied for free from my page on the website of Bidnetwork: http://www.bidnetwork.org/en/member/adriaankragten. 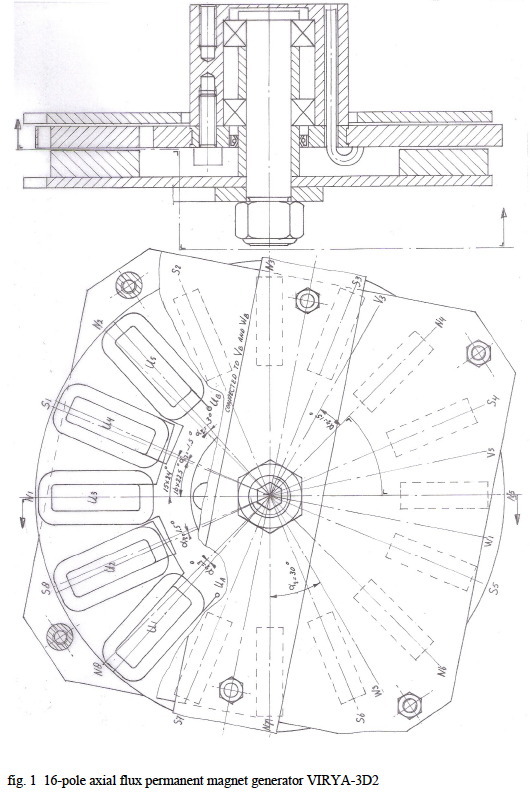 The most recent report is KD 531: “Ideas about a 16-pole, 3-phase axial flux permanent magnet generator for the VIRYA-3D2 windmill using 16 neodymium magnets size 50 * 15 * 15 mm”. In KD 531, a new idea is described how water can be pumped by a windmill. The windmill has a multi pole direct drive axial flux PM-generator and a fast running steel rotor with only two blades. The pump has a standard 3-phase asynchronous motor. For the VIRYA-3D2, the windmill has a 16-pole generator and the pump has a 0.75 kW motor. The same idea is described in report KD 529 for the bigger VIRYA-3.9 windmill which has a 22-pole generator and is meant for a pump with a 1.1 kW pump motor. Although the multi pole generator is specially designed for connection to the 3-phase motor of a centrifugal pump, it can also be used for battery charging if it is provided with a low voltage winding and if the 3-phase current is rectified. Public report KD 490: “Water pumping with a windmill” has been modified such that this new idea is now incorporated in chapter 5. At this moment I have no intention to build and test a windmill with a multi-pole axial flux generator but I will support someone who is willing to test this new idea of water pumping. This entry was posted in Adriaan Kragten, Books, construction, People, pumping water. Bookmark the permalink. Since yesterday I have my own website: http://www.kdwindturbines.nl . I have designed this website myself using the nice book ”Een website maken voor uw eigen bedrijf” (May 2014, in Dutch). The website gives information in English about my VIRYA-windmills and public KD-reports. From 1 February 2015, this information is no longer available on my page on the website of Bidnetwork because Bidnetwork is cancelled at that time and replaced by Bidx. I’m not sure that there is anything new in this idea as I think it has already been achieved by Grundfos. Anyway, the Grundfos SQ-Flex submersible pumps would be worth looking into for this type of project. The pumps (I use one) can basically run off anything, 30 to 300volts DC or 90 to 240volts AC single phase. I run mine off a directly connected PV panel 95% of the time and sometimes from my AC inverter or directly from a generator. It would be interesting to connect to a single phase axial flux wind-turbine. One side-benefit of pairing a deep borehole and a wind-turbine is that the steel casing of the borehole might make a good solid base for a free standing mast for the turbine. I suppose that the challenge is to get the pump to load the turbine optimally so that the tip speed ratio of the blades is acceptable. The pump might for example work at too low a voltage and stall the blades, or it might not apply enough torque so the blades overspeed. One could do a theoretical study if there is enough data for the pump. I haven’t got involved but every now and then somebody asks me about direct pumping and it seems like a useful area of study. I wish I had Adriaan’s mathematical skills! My real world experience of numerous pumps and boreholes and a short career in hydrometry make me think that there are too many variables involved in matching the pump to the alternator for a centrifugal pump with no electronics. The Grundfos SQ-Flex pumps have electronics in the pump itself and the pump is a helical rotor not a centrifuge so they behave quite differently. It’s definitely an interesting area which deserves attention and could be useful to many people around the world. Direct pumping is also easily achieved with purely mechanical wind-pumps and with compressed-air lifts and these methods should be considered too.